Black pepper contains high levels of antioxidants and piperine, a pungent alkaloid that not only aids the absorption of important nutrients like selenium, B-group vitamins, and beta-carotene, but also encourages gastric secretions, which help breaking down proteins, thus improving digestion. Additionally, it has been shown that piperine can effectively reduce internal inflammation by inhibiting small proteins called cytokines, which have been linked to a number of degenerative diseases. Black pepper's essential oil (BPEO) has been traditionally used to fight viral infections, colds, chills, muscle aches, joint pains, and throat ailments; however, its biological activities in human tissue have been scarcely investigated. This small in vitro study, carried by a team of scientists in U.S., was focused on the biological activities of BPEO in cytokine‐stimulated human tissue cells. 17 protein biomarkers related to inflammation and skin regeneration were exposed to BPEO and analyzed in order to determine the level of influence and mechanisms of action of black pepper's main compounds with the sample. BPEO was shown to modulate the synthesis of Collagen I, responsible for creating scar tissue when the skin repairs from injury; Collagen III, which helps to form fibrillar tissue in early embryos and it is a major component in cardiovascular development; and plasminogen activator inhibitor 1, a protein that plays an important role in cellular metabolism and which, when present in high levels, can increase the risk for thrombosis and atherosclerosis. When the samples were analyzed at a genetic level, evidence was found that BPEO also influenced important genes related to skin regeneration, as well as the communication process between cells that affects body's metabolism, inflammation, and tissue repair. This study is the first to provide evidence of the biological activities of BPEO in human deep skin tissue. 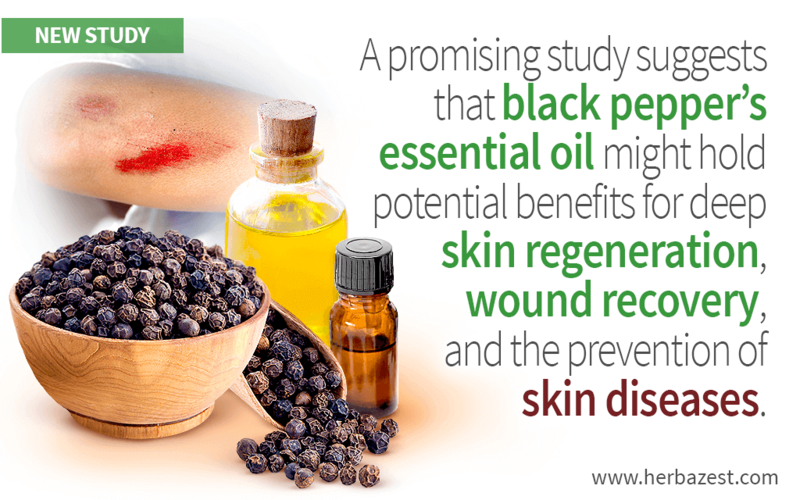 Although further research is required, this pioneering study would pave the way for further investigation on the therapeutic use of black pepper oil for treating skin conditions such as dermal regeneration, wound healing, and cellular metabolism, which might also help prevent the occurrence of scarring and degenerative skin diseases.